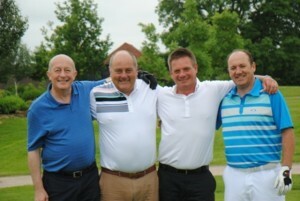 Representatives from 21 meat companies participated in the recent BDCI annual Golf Day, raising almost £8,000 for the charity. Festival chairman, James Sydenham, said: “My thanks go to all our sponsors and those who donated auction prizes and to everyone who made the effort to come along and support the BDCI. Special thanks go to Alan Bird from Two Counties Foods for organising the whole event and to the Cheale family for allowing us to use the course for the day. Pictured below is the winning team, comprising, L-R: John Wells, Two Counties Foods Limited, Sales Director; Garry Walker, Two Counties Foods Limited, Managing Director; Steve Harper, Tadmarton Products, Limited Sales Director David Fleetwood, Agro Europe, Director.